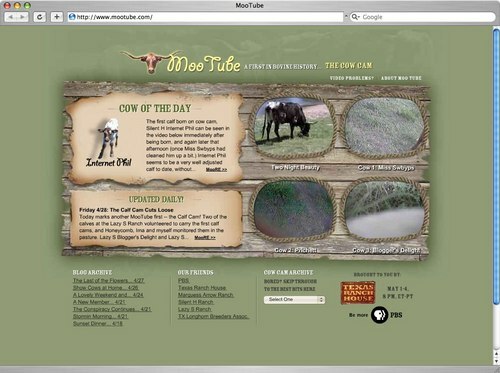 To help PBS promote their “Historical Reality Show” Texas Ranch House we concepted and created MooTube. Online video and YouTube was just becoming popular, and what better way to showoff life on the ranch than by bringing to life the “cow’s point of view”. We spent 2 weeks blogging and streaming video literally from the cow’s eye (well, right next to it) view. Working closely with PBS’s PR team, we drove the creation of dozens of articles and blog mentions to turn a crazy content experiment into a successful viral promotion. 101 is the world record holding steer with a tip-to-tip horn measurement of 100″, and he knows it. He enjoys quality eats such as prime alfalfa cube and fresh spring grass, although he’s not averse to a bit of late season hay when the grass is poor. 101 is outgoing and sociable, and enjoys visiting with cows and people alike. 101 signed up and participated in the first day of cow-cam filming as a camera operator, but unfortunately ended up with a faulty transmitter connection and his footage was all lost. He has since been lobbying for another chance. A New Member of MooTube! Rain! Thunder! Lightning! More rain and a hard gusty wind from the west! Wowsers, what a way to start the day. We were just snoozing in the paddock by the barn, when all of a sudden it hit us. Drops the size of a mean ol’ horse fly and with even more sting came pouring out the sky. We all got up and headed into the barn, jostling around to get covered and in from the blowing wind. Miss Swbyps was pushing us all in so that she could keep her dry viewpoint – she always has to play “bossy the cow” in these situations. Too bad my batteries are dead – would have been good to have it on camera to show her the next time she acts all innocent about such stuff. Speaking of cameras, I hope my transmitter is still good – the crew said it wasn’t supposed to get wet. Hmmm, not much that isn’t wet that was outside more than 10 seconds – they might have to fit me with a new one. Slowing down now; hopefully it will stop. I was looking forward to another day of showing the grass to the world. Speaking of grass, this rain will sure make it happy, been a bit of a dry spring; Benny already has the irrigation running a little. Maybe a day of rain is better than a day of cow cam after all. My moment has come! Since so many of yesterday’s camera operators were lazy bums and stayed out in the pasture this morning, the production team is giving me a second chance to shine. They’ve rigged me up with a custom harness, and are sending me out into the field with a camera for the day. So here goes. Wish me luck. Today, all of our footage comes from retired show cows. From the Silent H Ranch, Prichett, Lucy and Miss Swbyps all have worked in the cow modeling industry in some way or another. Prichett and Lucy both graduated from the 4-H Program at the Johnson Space Center Longhorn Project. They spent a good bit of their heifer-hood working with 4-H members, and participating in shows and contests. Miss Swybps is, of course, a cover girl and famous throughout the region.